The story begins shortly after the first movie ended. Will and Elizabeth’s wedding is cut short by the arrival of the East India Tea Company, and adventure ensues. Both find themselvse seperately pursuing the same goal – that being the meeting up with Jack Sparrow, and the retreival of his compass. But I don’t need to rehash the plot – you’ve already seen it. And if not, go see it. It’s worth it. So what’s good in the sequel? Lots. Chief amongst them is Tia Dalma, the creepy voodoo lady who lives “up river,” and provides our heros with sage wisdom and jars of dirt. Her performance is stunning, and her persona is at once off-putting yet beautiful. Also terrific was Davy Jones. A definite trend-breaker amongst bad guys, Jones has a strangely nasally voice that nonetheless manages to be frightening when need be. Davy Jones’ ship and crew are equally gorgeous, although a little over the top for my taste. What’s not so good? A wildly fragmented plot, for starters – including a huge detour to a cannibal island that really does very little to drive the story forward, and merely serves to show Jack acting goofy while his crew escapes from incredibly unlikely cages. Also difficult for me to buy is Norrington’s extreme departure from his previous sense of duty and honor – just because he’s on the outs doesn’t need to mean he loses all self-respect and starts rolling his eyes and acting like an imbicile. But most difficult to accept of all is Elizabeth’s sudden and inexplicable affection for Jack Sparrow. She spends the entire film disgusted at the very notion – and yet there she is at the end, hungering for old Jack. One aspect of this film that seems largely overlooked is the character development of Jack Sparrow himself. In the first film, we saw him as a quirky and independent rogue, seeking to reclaim his ship. Only in Deadman’s Chest do we finally get to see him performing his duties as a pirate captain, and you know what? He stinks at it. He drags his crew through several dangerous misadventures in the pursuit of his own interests, without even a hope of profit, and gets most of them killed in the process. He can’t take much of anything seriously, and he’s even willing to betray Will Turner and then engage in “soul harvesting.” Pirates are generally untrustworthy, true. But I have to wonder why Jack commands such respect and loyalty from Gibbs, Cotton, and Marty when they’ve nothing to gain from it, and with every likelyhood that Jack will bail on them when things get rough. Call me a traitor to the genre, but I’m beginning to understand why Barbossa and company mutineed – I think I’d leave Jack on a deserted island too. Jack’s more hammy than endearing, the action is more illogical than fantastic, and there are a few too many repeat jokes from the first film. But it’s a visual marvel, no doubt. And the plot – if a bit over long and unpolished – is still gripping. I’m somewhat dissappointed, but enjoyed the it just the same. And I’ll certainly be there on opening weekend come the third instalment. 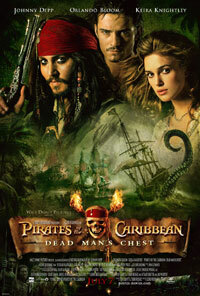 This entry was posted in Movies / TV and tagged adventure, disney, pirates of the caribbean by Bilgemunky. Bookmark the permalink.